from GE Review, December 1932. "The causes which have made it necessary to operate tungsten lamps at such relatively low efficiencies as one watt per candle have been little understood. It seemed, therefore, that an investigation of the phenomena occurring in tungsten lamps, carried out with a view of reaching a clear understanding of the causes of the failure of the lamps, might possibly open the way to the discovery of methods by which the efficiency could be greatly improved." Irving Langmuir received a Ph.D. in physical chemistry in 1906 from the University of Göttingen. He studied under Walther Nernst who had invented a new type of incandescent lamp only a few years before. 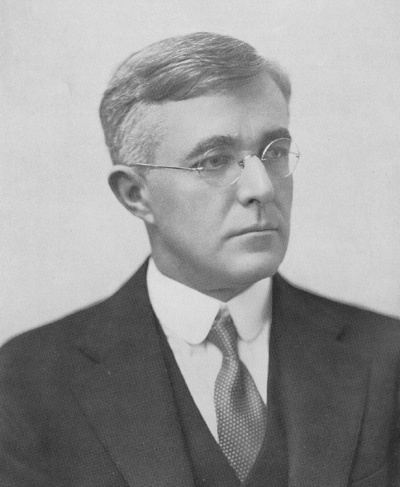 After graduating, Langmuir took a teaching position at the Stevens Institute of Technology but left in 1909 to accept a position at the General Electric Research Lab. Ironically, he soon invented a lamp that made the Nernst Lamp (among others) obsolete. In 1910 Langmuir began to experiment with bendable tungsten wire developed by his colleague William Coolidge. Langmuir's goal was to find a way to keep tungsten lamps from "blackening," or growing dim as the inside of the bulb became coated with evaporated tungsten. Though his work did not solve this problem it did result in a coiled tungsten filament mounted in a gas-filled lamp -- the same design still used today. Up to that time, vacuum lamps had been common. Langmuir found that if he put nitrogen into a lamp, he could slow evaporation of tungsten from the filament. He then found that thin filaments radiated heat faster than thick filaments, and coiled tungsten wire radiated heat as if it were a solid rod. Overall, his lamps gave 12 to 20 lumens per watt (depending on the wattage), while Coolidge's vacuum lamps gave about 10 lpw. Over the course of the 1920s, GE began phasing in Langmuir's "Mazda C" lamps. Langmuir's research extended beyond electric lighting, however. In 1932 he received the Nobel Prize in chemistry for work on "surface chemistry," a rare honor at that time for a corporate researcher.